This tribute can command and take the stage by storm and given such ability, talent and sound, her tribute to Adele is unique. 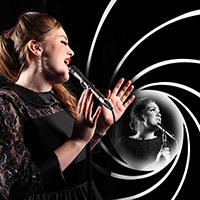 Just Like Adele's uncanny resemblance and quality singing voice guarantees an Adele Tribute Night of the highest quality which leaves audiences in awe. Just Like Adele's show Features songs from both Adele's Albums including Skyfall, Someone Like You, Make you feel my Love, Day Dreamer, Rolling in the Deep, Turning Tables, Love Song, Don't you Remember, Set Fire to the Rain, Take it all, Rumour has it, and many more!